Both AIIM and Forrester surveys reveal the failure of the “single repository” dream. According to Forrester, 70% of organizations are using two or more ECM solutions, and 29% are using four or more solutions. 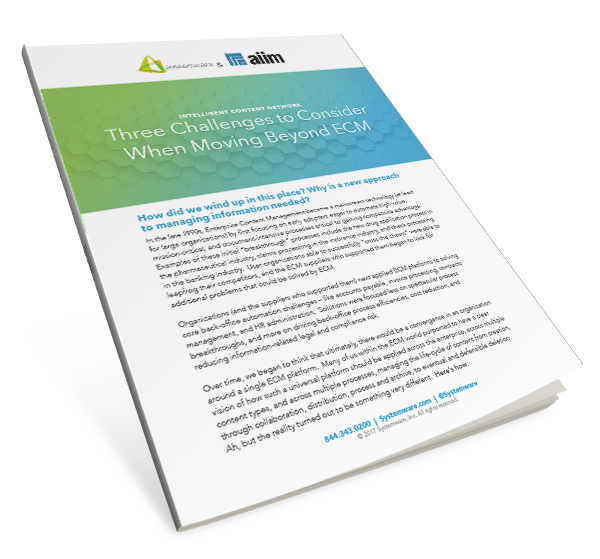 AIIM reports that 52% of organizations have three or more ECM/DM/RM systems and 22% have five or more systems. Information management technologies, servicing business landscapes using traditional technologies, are failing. The impact of these burdens is becoming more evident and the pace at which this is occurring will only quicken.